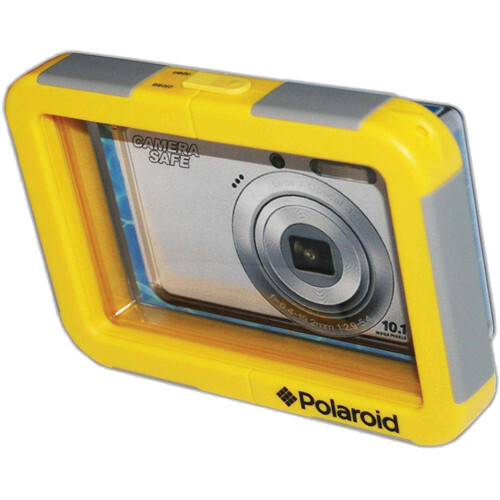 This Polaroid Waterproof Camera Housing with Flat Front accommodates select extra-small digital cameras and features a depth rating of 30' (9.1 m). It has a unique 2-piece track-lock system for closing the housing that also enhances rigidity and protects the camera from bumps or impact. The housing provides full access to virtually all key camera controls but does not allow for zooming, as the flat front is too close to the camera to enable the lens to extend at all. The lens portion is made of a unique optical-grade plastic composite which minimizes light drop-off and ensures clear images. Additionally, the clear front of the housing allows for the use of the camera flash underwater. The housing is compatible with select compact Sony Cyber-shot models, as well as other cameras with the same or smaller dimensions. Rugged housing provides full access to virtually all cameras key controls and features. Does not allow for zooming, as the flat front is too close to the camera to enable the lens to extend at all. Sealed gasket design for added protection from water and elements. Depth tested to 30' (9.1 m). Clear plastic on face of housing allows underwater flash use. Compatible with Sony Cybershot DSC-TX1, TX5, TX7, TX9, TX10, TX20, TX55, TX66, TX100V, TX200V, T90, T99, T110, and T900 cameras, as well as others of the same or smaller size. Box Dimensions (LxWxH) 8.0 x 6.5 x 1.75"
Waterproof Camera Housing with Flat Front for Select Compact Point-and-Shoots is rated 5.0 out of 5 by 2. Rated 5 out of 5 by Z3DBL6 from Good Value I tested it in a bucket and there was no leakage. For such a price, it's a decent case. Pressing the buttons through the flexible hard plastic can be tricky (must push hard). My T-90 fits well inside (can't use the touch screen though). Unlike a pouch, it fits a limited number of cameras but it's sturdier. Waterproof feature aside, this case can also serve as a protective jewel box for rough conditions since it's tough enough to take punishment (to some degree). Could use a better plastic window on the front for better pictures. Rated 5 out of 5 by adrenjunkie from Awesome I took this to the beach in Miami as soon as I got it and I was totally grateful it worked and didn't mess up my $ Sony cyber shot camera. The pieces they give you to fill the extra space was a great addition. The only thing is I couldn't zoom in that well when the camera was inside. Besides that I would buy another one!